Aiming to work miracles for tarnished insurance giant AIG. Steve Miller led a turnaround team at Delphi. He has now landed at troubled insurance giant AIG. Robert “Steve” Miller, the former chairman and chief executive officer of the bankrupt Delphi Corp., has reappeared on Wall Street, signing on as chairman of AIG, the badly tarnished insurance giant, which was at the center of the financial panic of 2008. Miller succeeds Harvey Golub as chairman of the AIG Board of Directors, who quit after a row with AIG’s current chief executive officer, Bob Benmosche. AIG was the largest single recipient of bailout funds from the federal government’s controversial Troubled Asset Relief Program, or TARP – the same source of rescue money used to save General Motors and Chrysler. The insurance company’s business and trading practices, executive compensation, and ethics have all come under intense scrutiny since it was bailed out by the U.S. Treasury. Currently, the 68-year-old Miller also serves as the chairman of MidOcean Partners and is considered one of the nation’s leading executive experts on corporate restructuring and bankruptcy, having been at the center of a variety of different companies going through financial crises, including Delphi, Federal Mogus, Bethlehem Steel, Morrison Knudsen and Waste Management. At Delphi Miller broke the UAW’s control of the workforce as it emerged form bankruptcy with non-union workers. But Miller’s reputation as a turnaround specialist was firmed up, 30 years ago, as part of the team led by Chairman Lee Iacocca that pulled Chrysler out of a prior financial crisis. Miller was named to the AIG board in June of 2009, but the media did not pick up on the significance of the move at the time. Delphi emerged from bankruptcy in the fall of 2009, clearing the way for Miller’s retirement from the suburban Detroit auto parts manufacturer. 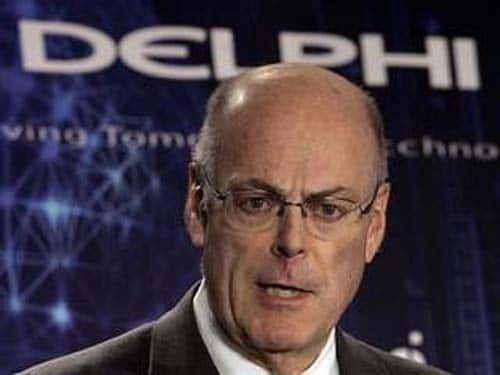 Prior to joining Delphi in 2005, Miller had served as chairman and chief executive of Federal-Mogul, Inc and as chairman and CEO of the bankrupt Bethlehem Steel Co. before it was sold to financier Wilbur Ross in 2003. He was also Chairman and CEO Waste Management from 1997 and 1999 and Chairman of Morrison Knudsen from 1995 and 1996. Miller, who started his career at Ford also was vice chairman and chief financial officer of Chrysler Corp. under Lee Iacocca. Miller also is a director of the software company Symantec Corporation and United Air Lines. AIG operates in a 130 countries and jurisdictions and AIG companies are leading providers of life insurance and retirement services around the world. This entry was posted on Thursday, July 15th, 2010 at and is filed under Automobiles. You can follow any responses to this entry through the RSS 2.0 feed. Both comments and pings are currently closed.